The protests saw barely any impact on the financial capital, with neighbouring Thane and Navi Mumbai remaining completely peaceful. 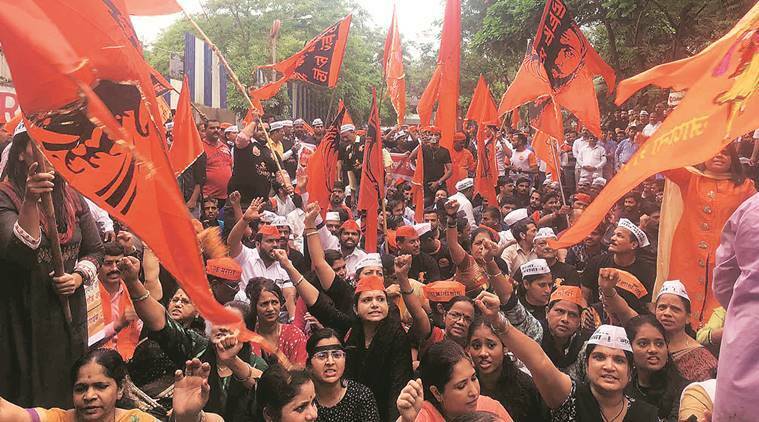 Even as leaders of the Maratha Kranti Morcha said agitations would continue in the coming days to press for their demands, the protest and bandh called by them passed off peacefully in Mumbai on Thursday with no major incident or disruption in public services. Several establishments remained closed especially in the morning hours, including the vegetable market in Dadar and the APMC market in Vashi. The number of buses, taxis and autorickshaws plying on the streets was low, but no incident of violence was reported from anywhere in the city. A sit-in protest outside the office of the Mumbai Suburban Collector in Bandra (East) was held from 11 am to 2 pm. Around 1,000 protesters took part, including some women and children, who later dispersed peacefully. “Our major demand is withdrawal of all cases registered against Maratha youths for violence during the bandh observed on July 25. We have been protesting for two years but the government is just delaying decisions on our demands. Besides, the statements of ministers provoked the youth to pick up lathis instead of the flag. So it is the government which is responsible for the violence. All cases should be withdrawn,” said Virendra Pawar, convener of the Maratha Kranti Morcha. Pawar further said the government must announce and hand over Rs 50 lakh each as compensation to families of all members of the Maratha community who committed suicide over the past few weeks. “More than 25 Maratha youths have committed suicide and given their life for the movement. So, the government must give them compensation of Rs 50 lakh immediately and shouldn’t take months for it,” he added. Another leader from the Maratha Kranti Morcha admitted that groupism in the movement had become a worrying factor. “Some of the youths are not ready to follow the decisions of the majority and want to go ahead with what they feel is right,” said the leader. Amol Jadhavrao, another leader of the Maratha Kranti Morcha, who had given the call for a Mumbai bandh, claimed the bandh was successful and peaceful. “Places such as the vegetable market in Dadar, Dadar TT, Naigaon in Dadar, Byculla and a few others were completely shut. As we had exempted all emergency services and also schools and colleges, everything was smooth in the city, without any violence,” said Jadhavrao. “There is a lot of anger among the Maratha youth against the government. So there will be more protests in the coming days. We will soon have meetings to chalk out a strategy,” said Pawar.